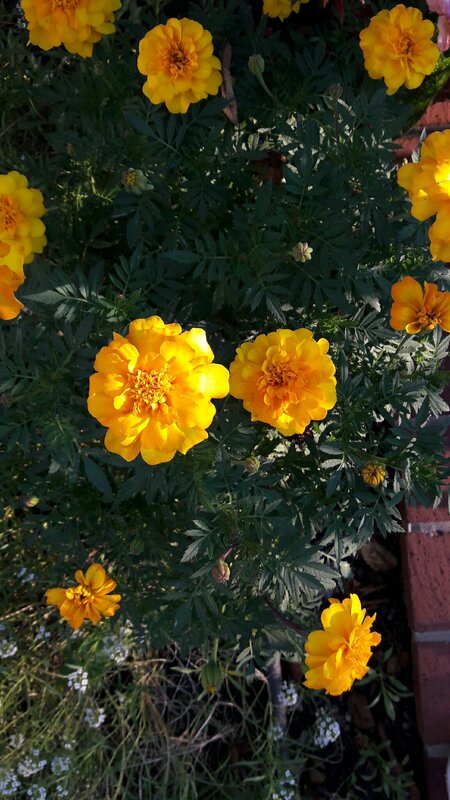 I enjoy looking at these brightly colored, annual, orange flowers that continually bloom throughout the end of summer and into fall in my garden. They make good border plants or as companion plants to your veggies. Start the seeds after all chance of frost. They start to germinate in 3-5 days in temperatures around 75-80f. Keep the medium most and not too wet. Once the first leaves come out, add a little fertilizer and water a little less. At this point, they will prefer the cooler weather. 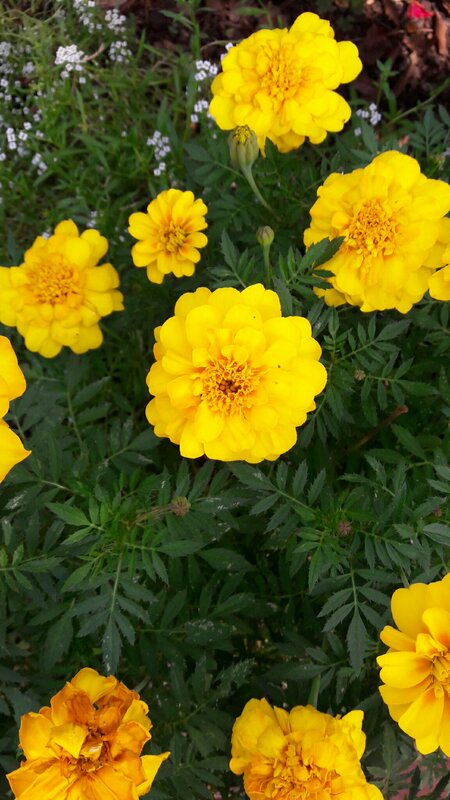 The Marigold prefers weather between 60-75 typically so they can do well in spring or fall. Keep in well-drained and slightly higher pH soil. To raise the pH, you can add a small amount of peat moss. But, the flower is fairly hardy and I’ve put mine in clay like soil where I added home made compost and it is doing very well. I planted mine in an area that gets a lot of light but, is near a larger rose bush which does provide some shade for it. 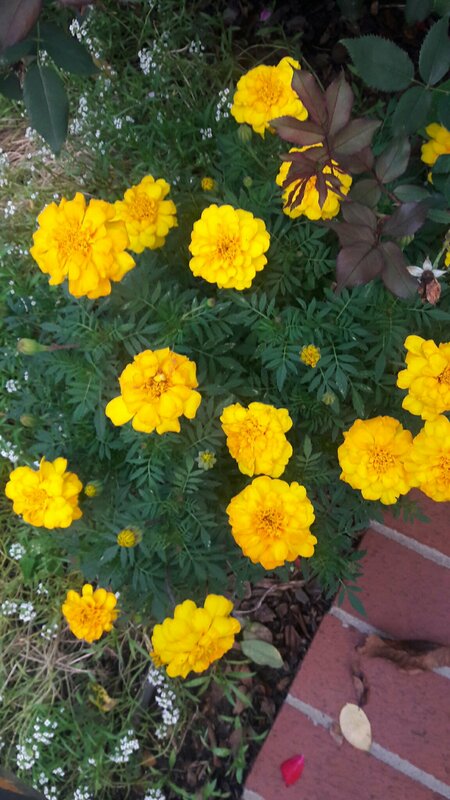 However, Marigolds do require plenty of sun; if they become leggy then most likely there is insufficient light. 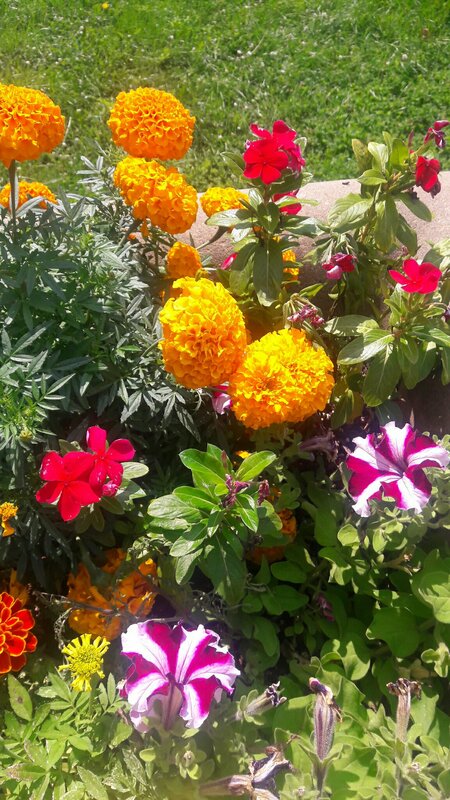 I personally do not use fertilizer but, there are things you can add to the soil for a healthier plant or for more flowers. Add a soluble salt, like Epsom salt, or a balanced solution of nitrogen-potassium. These plants appreciate dead heading in order to encourage additional blooms throughout the season. I simply pinch off the dead flower head when I see one. Sometimes I do this as I walk by my garden or I’ll spend time on the weekend picking off the spent blooms to ensure more pretty orange flowers will bloom. This flower also works outstandingly as a companion plant. Some feel that the smell of the flower is offensive. Having smelled it, I do not find it bothersome. They detract other bugs however which is why they are a good companion plant. Some plants that may benefit by having the Marigold nearby are cucumber, melon, basil, broccoli, eggplant, squashes, and tomatoes. You may find slugs on the plant in more damp conditions. They are slimy and a bit icky but, try picking them off to prevent them eating your plant. I tried the beer trap and that worked well to attracts the slings away from my plants. Otherwise, encourage birds in the garden who will take care of your slug and other bug problems. I luckily have a lot of birds, for a busy city, and they eat up the bugs and slugs pretty well. I hope this encourages you to try out the Marigold next season. 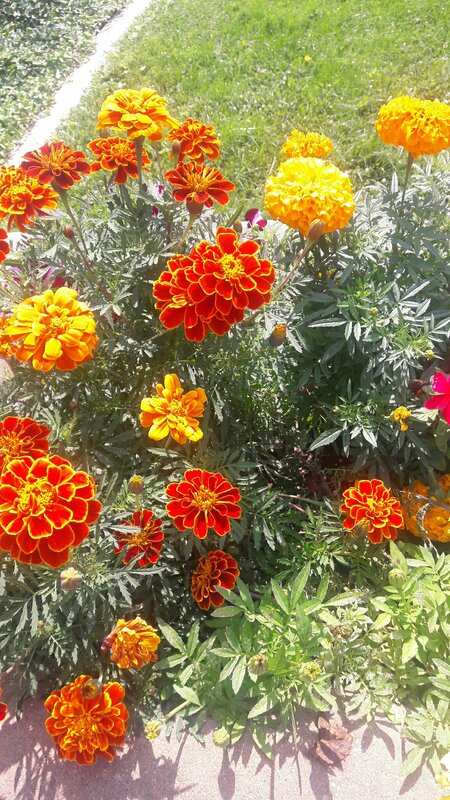 There are quite a few beautiful varieties of orange colors that can be cheerful additions to your garden. 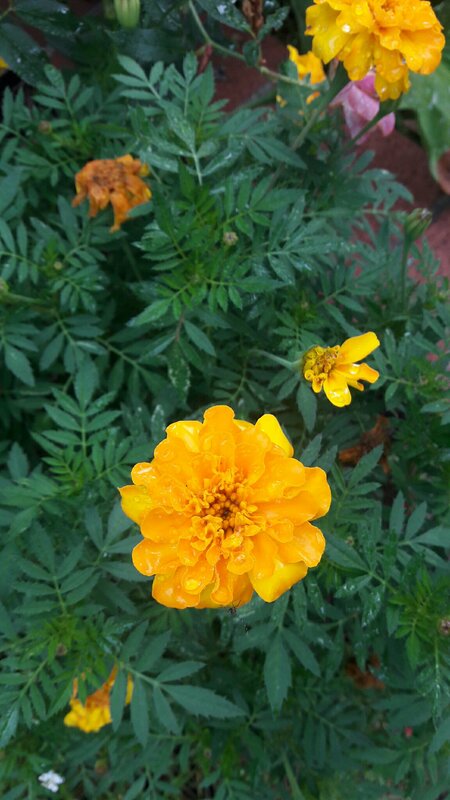 I made a long stitches years ago for Autumn and it contains marigold in the pot in front of the sweet home. I still enjoy to have this collection craft in my house.